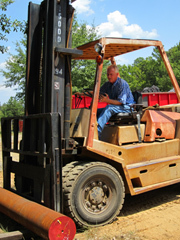 Founded in 1994 by John W. Golden, Jolly Metals Company is a recognized steel distributer located in Harleton, Texas. Named after his late “Uncle Jolly” John Golden, a prominent leader in the metals industry, Jolly Metals Company continues the family legacy of impeccable customer service and customer satisfaction. In the tradition of excellence instilled at Texas A&M University, John owns and operates Jolly Metals Company with integrity, honesty, and ethical leadership. The company experiences steadily increasing growth based on its strong reputation for consistent and excellent quality, as well as outstanding customer service, and competitive pricing. Copyright 2014 Jolly Metals Company. All rights reserved.